Me and the Smart Car for the last time. Those who know me, know that I would usually be the last one to join a political campaign, let alone a mayoral one in Toronto. I just wanted to let everyone know that I had the second best job on the Joe Pantalone for Mayor Campaign. Joe of course had the best one. 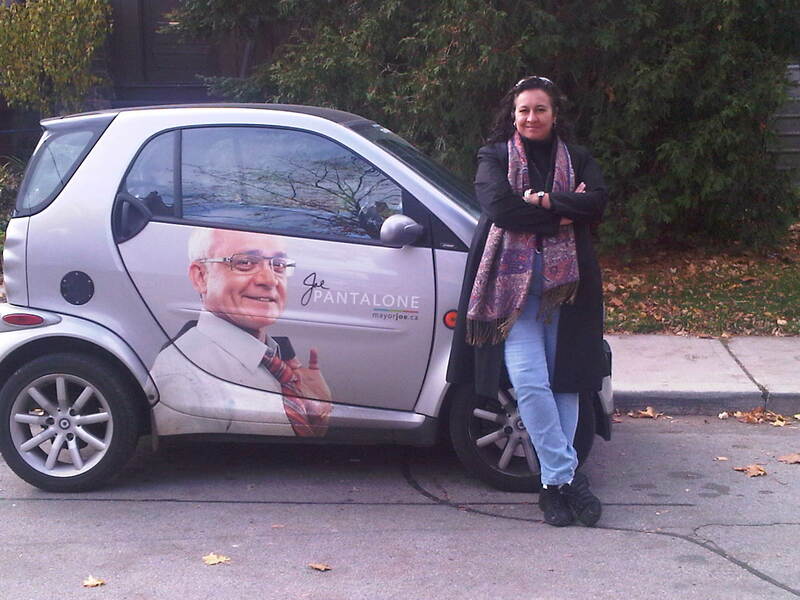 But I had the honour of being his personal mobile assistant for the last three months and of course, driving the Smart Car for the best candidate for mayor that Toronto had in this election. I’m really sorry that he didn’t get elected, but even when I saw him earlier this week while waiting for the streetcar (yes, we had to give the car back and we were both taking transit), he had a big smile on his face and still had a joke to tell. I was lucky enough to see him everyday, share his experiences and listen to endless stories; all jam-packed into a few short months. I saw him probably more than anyone during the time I worked for him and I have to say that I have met very few people with as much integrity and honour about what they do everyday and what they defend than Joe Pantalone. I honestly enjoyed working with him. I wouldn’t have stuck with the campaign as long as I did if I didn’t get along with him. Don’t worry friends, for I am sure that he will land on his feet and it will be big. I have no idea what it might be, but I hope that I can be a part of it. I’m sure that many Torontonians are already regretting not voting you in as the new mayor of Toronto. Hats off to you Joe. You are truly a class act. Congratulations. PS. We got him addicted to Twitter, so make sure you follow him on #FollowFriday: @jpantalone. Maybe he’ll pick it back up again with some encouragement. I know I would look forward to it.